10 Things You Might Not Know About ROCKY II | Warped Factor - Words in the Key of Geek. 1. Just as he had done when he was writing the first Rocky script, Sylvester Stallone incorporated biographical elements from his own life into Rocky's story for the sequel. In particular, Stallone used as a central plot point the concept that yesterday's heroes are quickly forgotten. 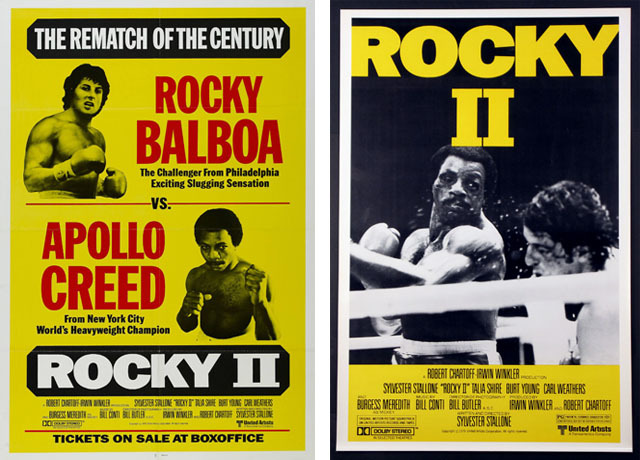 In the film, this manifests itself in terms of people quickly forgetting about Rocky's exploits in the title fight. In reality, Stallone experienced a similar sense of being quickly forgotten after his two post-Rocky movies, Paradise Alley and F.I.S.T., both of which bombed at the box office. 2. 1978's Paradise Alley was Stallone's directing debut, with Rocky II being his second turn behind the camera. Sly slipped a nice little nod to Paradise Alley during the ambulance drive to the hospital that takes place through the opening credits. A poster for the movie can be seen plastered over the back of a bus. 3. 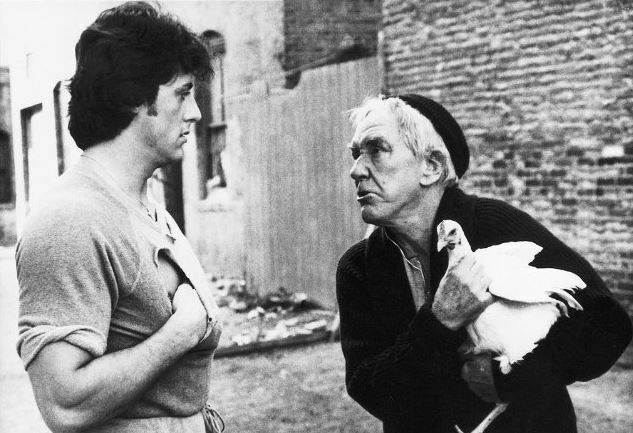 In Stallone's original version of the screenplay he included a flashback scene showing Rocky's first meeting Mickey Goldmill, his trainer and manager. In it Rocky's real first name was revealed - it's Robert. 4. Chuck Wepner, the real-life inspiration for Rocky, was offered the part of a trainer named "Chink Weber" in Rocky II. Wepner revealed that he read for Stallone but it didn't go so well, so the character was deleted from the script. However, Sly reused the name "Chink Weber" for Sonny Landham's character in the movie Lock Up. "You're sparring and you say to yourself, 'Hey, maybe I can go with this guy.' Then you trade a few shots, and you realize you're an actor again." 6. During his preparation for the film, Stallone was bench-pressing 220lbs when the weight fell and tore his right pectoral muscle. This was shortly before the main fight scene was to be filmed, and it was not possible to postpone, so Sly shot the fight still badly injured. 7. Adrian's role in the movie had to be re-written as Talia Shire was committed to other projects and unable to film throughout most of the duration of the Rocky II shoot. Originally she was supposed to be at the big fight, cheering on Rocky from the sidelines, but the coma storyline was added so that during her recovery it would be logical for her to stay at home and watch the fight on TV. Shire then left production to film the movie Old Boyfriends, and four months later returned to shoot the scenes of her watching the boxing match on TV. They were then edited into the movie several months after the rest of principal photography had finished. 8. It turned out that Talia Shire's break from shooting didn't end up holding anything up, as it took Sly and editors Danford B. Greene and Stanford C. Allen over eight months to edit the climatic fight scene so as to meet Stallone's approval. 9. The route Rocky takes through the city of Philadelphia during his training run - from his South Philly house, past local landpoints, picking up more than 800 local schoolchildren, ending at the top of the Art Museum steps - was later analysed for accuracy. It is approximately 30.2 miles. 10. 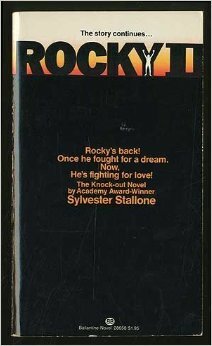 Sylvester Stallone himself wrote the novelisation for Rocky II. The novel is mostly in first person, from Rocky's point of view, and presented in the same choppy English in which Rocky speaks. 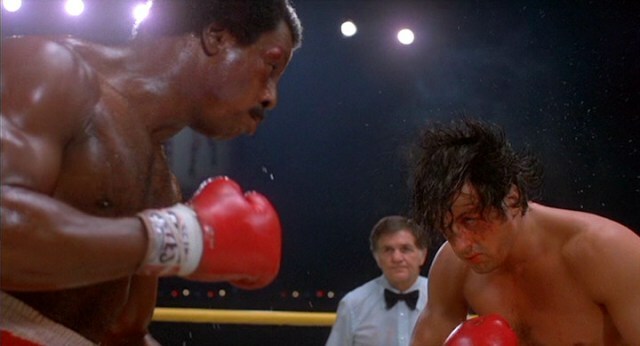 Scenes in which Rocky is not present (such as Apollo Creed consulting his associates, or Paulie alone with Adrian) are in standard third-person, and in proper English.